Theresa's Gaelic accenting could perhaps be compared to Alex Francis MacKay and, like Alex F., she chose pianist Gordon MacLean as her accompanist. Theresa also has a newer CD. Titled Lake Bras D'Or, on it she is accompanied by Doug MacPhee. 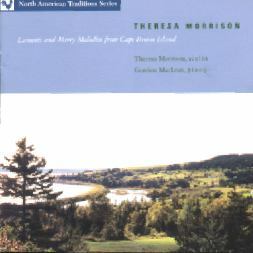 This is fiddler Theresa Morrison's first recording. Years of experience make her music as flavourful as any you may have heard. The repertoire includes tunes which are ancient as the hills, as well as others that Theresa composed herself. Originally from Washabuck, a community along the shores of the Bras d'or Lakes, seven of her brothers and sisters played the violin, the most well known being her older brother the late Joe MacLean. 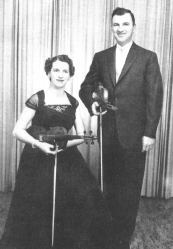 Theresa Morrison and her brother Joe MacLean, 1959.